During summer in Canmore, Quarry Lake and the surrounding landscaped grounds are filled with locals swimming, sunbathing, and picnicking. It’s an excellent destination for families with children of all ages. Younger kids can test the water in the shallow sandy west end while older children (and adults) will find low cliffs perfect for jumping from further around the lake. The western end also has picnic tables and washrooms. Elevation Place (700 Railway Ave., 403/678-8920, 6 a.m. to 9:45 p.m. Mon. to Fri., 8 a.m. to 8:45 p.m. Sat. and Sun.) 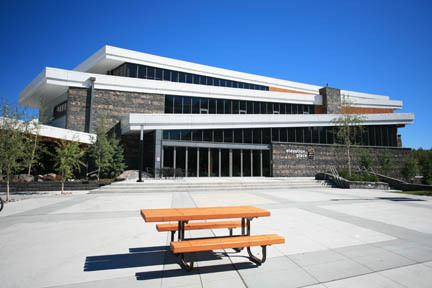 is an impressive leisure centre at the eastern entrance to downtown. It is home to two swimming pools, one with waterslides, a toddlers’ area, and a lazy river. The complex also has a climbing wall, fitness room, and a library. A swim pass is adult $8, child $5.